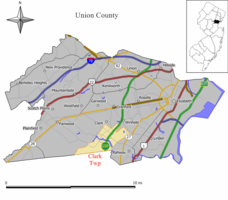 Thinking of buying or selling a home or property in Clark, New Jersey? Let Daunno Realty’s team of Realtors help! Please contact us today. For more information about Clark, NJ please see the information below. New Jersey Monthly magazine ranked Clark as its 33rd best place to live in its 2008 rankings of the “Best Places To Live” in New Jersey. In 2013, New Jersey Monthly magazine ranked Clark as 174th in its rankings of “Best Places To Live” in New Jersey. Esposito Park on Madison Hill Road was recently named one of “7 New Jersey Playgrounds Worth Traveling To” by New Jersey Family magazine.